Welcome to Male Pattern Boldness! 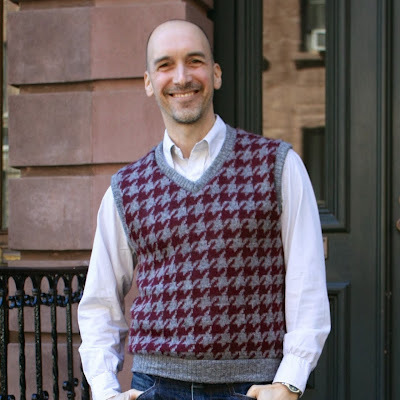 My name is Peter Lappin and I'm a native New Yorker, raised in the Bronx and currently living in the Chelsea section of Manhattan (a stone's throw from the Garment District) with my partner, Michael, and our two chihuahuas, Freddy and Willy. In Spring, 2009, I picked up a pair of used designer jeans at my local Goodwill. They fit in the waist but the inseam was too long and needed to be shortened. Unfortunately, to have these jeans hemmed professionally (at a local dry cleaners that does alterations) would have cost more than I'd paid for the jeans themselves. It occurred to me -- I'm not exactly sure how or why -- that I could pick up an inexpensive sewing machine (back then I had never even touched a sewing machine, let alone known how one works) on Amazon, and perform my own basic alterations. The machine should pay for itself in no time. I did extensive online research and stumbled onto some sewing blogs that recommended vintage sewing machines -- 1960's and 70's era Kenmores in particular -- because they were sturdier than modern machines and could tackle just about any sewing job. I found one on eBay, clicked "Buy it Now," and less than a week later I was teaching myself how to sew. Almost immediately I realized I could do a lot more with a sewing machine than shorten my pants! I quickly discovered the online community at Pattern Review (PR). PR members were tremendously helpful and supportive, recommending sewing books, loaning me instructional videos, and explaining basic sewing techniques like installing a zipper, making a buttonhole, and attaching interfacing. Over the last six years I've applied myself to sewing with the dedication of a monk. I have sewn just about every sort of men's and women's garment -- everything from 1920's women's pajamas to classic men's tailored peacoats, from cocktail dresses to jumpsuits. (Be sure to check out the "Projects" tab to see what I've made.) To say I love to create clothes is an understatement. In sewing I have found my life's true passion. The mission of this blog is to share my passion with sewers from all over the world, at every level of experience. Welcome to Male Pattern Boldness -- look around, put your feet up, and make yourself at home! Peter where do you get your elastic for the boxershorts? Great site!! I have Singer Buttonholer (the one in the green box), and wonder.... can be used on a vintage Brother 150? I'm not familiar with the Brother 150, but if it is a standard short-shank machine (which I suspect it is) and the feed dogs drop (or your have a plate to cover them with), then I suspect the Singer buttonholer will work. Hello Peter! I am looking for your contact info and hit you up on your facebook page too. I have some sewing questions and an idea for you! You can reach me at peterlappinnyc at gmail dot com. Or through my Male Pattern Boldness Facebook page. Awesome! Emailing you now. Thank you. Peter! Did my email ever come through? Came from Angela Shelton dot com. I read on one of your posts that you have two versions of Reader's Digest Complete Guide to Sewing. Is there a certain version that you prefer or recommend? My 1976 edition has a larger section on tailoring than the 1995 edition. But both are still excellent sewing books. As a guy who's interested in learning how to sew, I was wondering what sorts of projects you started out with -- did you start out right away making things that you wanted to wear? Since I was starting from zero, I made the simplest things I could -- I think my first project was a sewing machine cover -- and very basic men's garments like boxer shorts and caftan tops (no cuffs, no collar). Hope that helps! Just wondering about MPB - are all your vintage patterns used? and if they aren't then how to you make a new usuable pattern from a used / cut-up pattern. Any suggestions. I work for a large repertory theatre company in Canada. I'm looking to buy a man's summer union suit for one of our productions and I see that you purchased an old one with the intention of making a pattern. Did you make the pattern? Would you be interested in selling a pre-made summer union suit to us, approximately size 40? I can be reached at ecopeman@stratfordfestival.ca Many thanks! I recently found a elna 1 at a second hand store here in Stockholm Sweden. I picked it up becuase of the sturdy build and the compact size. After the Google search I found out what a wonderful gem I found for something equal to 20 US dollars. But now I need some help getting it to work. The motor runs like the dream. But the shaft seems have a hard time moving. I was wondering if you and help or point me in the right direction. You'll want to oil the shaft. Here's a link to a PDF of the manual. I'm so happy I discovered you. Your video with the vintage singer green box buttonholer persuaded me to get one, and it solved my button hole problem for my first shirt. The buttons did not match any cams for either of my more familiar attachments. Thank you for sharing your passion . It's becoming one of mine too. So glad you're enjoying the buttonholer, Joe. Thanks for letting me know! I have just read about this new item for the men's wardrobe, that ist a big success in France. What do you think about it? The link is not to make an advertisment about the item, but I found interessting that it is been present as a "new idea" and I am not sure if really is... wasn't there something like this before at the first-half of the 20th Century? Interesting! There was a garment like this, a sort of onesie, but it was meant to be worn underneath clothing. The problem with this is that the underwear part is likely to get dirtier (and wear out faster) than the shirt part. Thanks for sharing it, Andrea! And the guys wearing it alone look like they're walking around in their underwear. Hi Peter. I enjoy reading your blog and have come to the conclusion that you must be a "sewist" on steroids - in a good sense. You sew for yourself, Michael, your identical cousin, Cathy, your Mom, your dog...and your garments come out soooo beautiful. In addition, I love reading about all the classes you take and your progress throughout. Can you get any better? I think you're already at the top. And speaking of your Mom, while I can't be her identical cousin, perhaps a fraternal cousin. (kidding). Keep up the good work. I would like to personally congratulate you as your blog Male Pattern Boldness has been selected by our panelist as one of the Top 100 Dressmaking Blogs on the web. I was wondering if you have any pattern suggestions for a young man whose 6'4" and wears a size 28x36? I make his dress shirts, but have never made men's pants. At some point I will need to tackle a jacket for him as well. Thanks for your great work. I suggest you take a standard men's pants pattern and add length to accommodate his height -- the pattern will say where to add the length. If you need to take in the waist, you can do that at the center back seam as well as at the side seams. If you want jeans, go with a Kwik Sew men's jeans pattern -- they have excellent instructions. Pants patterns are pretty standard so I can't really recommend one over another. Good luck with it! Your blog is awesome and inspiring! I'm a recovering fashion student and I was always sad we never made men's clothing. Your blog has been an excellent resource on my quest to make clothes to fit my male friends!! Thank you! I love your stuff so much that I recently referenced http://malepatternboldness.blogspot.com/2011/04/sewing-growing-and-flowing-8-benefits.html in my latest infographic "14 Reasons Why Sewing is Good for You." I'm just sending you a message to give you a heads up. I'd be tickled pink if you share the infographic with your readers. Hey MPB, just pulled out my school's old sewing machine and guess what it is?! A Kenmore 158-1212! I'm new to sewing and a project we are doing is forcing us to use the machine, but I can't seem to figure out how to load the spool for the bobbin. On other machines, I loosen the big wheel, which disengages the needle and sets the top spindle going, but on this one, it doesn't. Any hints? Thanks. Peter - do you think that your red work jacket could be made in a wool flannel? I have the Japanese book, and DH would like a jacket in a warm fabric. Thanks for any advice that you can offer, and I love your blog! Thanks, Kris. I think wool flannel would work, yes. Thank you so much for your feedback, and hearty congratulations on your nuptials! Peter, can we have a post on the menswear talk at FIT? Hello Peter, I love your blog! You are an inspiration and extremely talented. I took a home economics class in 7th grade and made a book bag. All it took was finding a Singer from the 1940s. Now I'm back to it. The machine itself is a work of art. All I have to do is look at it and it inspires me. If someone has something to say to me about my passion for art and craftsmanship then they can say it. At the end of the day I create the world around me.